Disclaimer: I have nothing against races and nothing against reaching your goals so if you run marathons or whatever I think that is wonderful! This past weekend, on Halloween I was supposed to run in the Philly Rock n Roll Half Marathon but I didn’t. I signed up because a few of the girls I work out with were doing it. Honestly, I ran a half marathon a couple years ago and said I would never do it again. Peer pressure sucked me in to sign up, we trained (barely) and I was doing it despite my lack of excitement. It was just a couple days before and the mission of doing it out weighed my enthusiasm to run. When I told everyone I’m not doing it they were sweet to try and sway me otherwise but I had such a peace and weight lifted from my shoulders nothing could sway me!! Saturday morning I felt like I still wanted to run 13 miles and I was up early thinking where and how I would do it. I plotted a plan in my mind and hit the road from my front door as soon as the sun started to rise. It was cold but I had my Christian music playing, the sun was rising, and I was immediately filled with God’s presence. It feels like a flood down my bones, overwhelming love, and tears just well in my eyes. There is truly nothing greater then knowing you are right where you are supposed to be. I come up to the road I “planned” to turn on and it had a detour, the bridge was out. I immediately in my mind said, “shoot, I don’t want to turn around but I don’t want to go straight because I don’t know the roads that way.” I here God say, “trust me, I will direct your path”. As I type this tears fill my eyes because that is my only prayer. I only want to be on God’s path not my own. I went straight, and when I wanted to turn I kept waiting for God to tell me where to go. He didn’t tell me in advance and He didn’t tell me when I was mentally saying where I wanted to go. It was when I was quiet and listening, and when I HAD to make the decision and not a second earlier. I went down the most beautiful roads that I have never been on, I went further from my home then I ever would have dared to travel. The most incredible part was He took me down a main, high traffic road that was closed for the exact 2 miles He had me on it. They were paving just the one side, it was crazy! 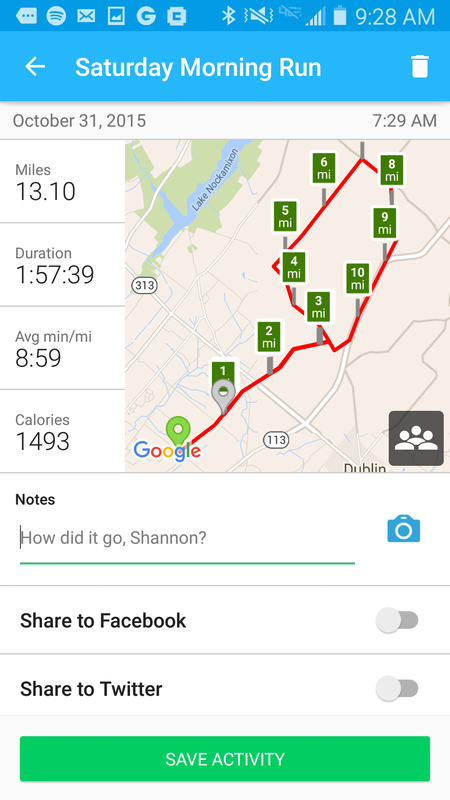 As I started to loop back to my house, now knowing where I was I couldn’t believe how perfectly I was ending at 13.1 miles! I took a screenshot because it blew me away!! I found this to be such a great example of how we need to live our lives. No matter what everyone else is doing, close your eyes and trust Him, trust Him with every turn, every detour, every fear. He is perfect! His ways are perfect! We may not see it at the time but He works all things together for good for those who trust Him. I know I didn’t run the big race but I am running God’s race He has set for me and there is nothing greater!! This lesson comes as we are on the countdown to leave in an RV for 2 months across the country with my family….with God’s plan not our own!! So amazing Shannon! I loved reading this and definitely gave me the chills, I wish I could have ran with you! !